Benigno Simeon Cojuangco Aquino (born February 8, 1960) also known as Noynoy Aquino, is the 15th and current President of the Philippines. Aquino is a fourth-generation politician: his great-grandfather, Servillano "Mianong" Aquino, served as a delegate to the Malolos Congress; his grandfather, Benigno Aquino, Sr., held several legislative positions from 1919–44; and his parents were former President Corazon Aquino and former Senator Benigno "Ninoy" Aquino, Jr . Aquino is a member of the Liberal Party. Born in Manila, Aquino graduated from Ateneo de Manila University in 1981 and joined his family in their exile in the United States shortly thereafter. He returned to the Philippines in 1983 shortly after the assassination of his father and held several positions working in the private sector. In 1998, he was elected to the House of Representatives as Representative of the 2nd district of Tarlac province. He was subsequently re-elected to the House in 2001 and 2004 In 2007, having been barred from running for re-election to the House due to the term limit, he was elected to the Senate in the 14th Congress of the Philippines. Following the death of his mother on August 1, 2009, many people began calling on Aquino to run for president. On September 9, 2009, Aquino officially announced he would be a candidate in the 2010 presidential election, held on May 10, 2010. 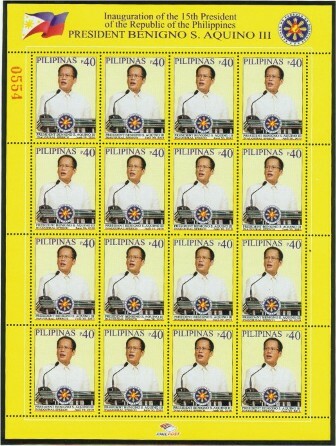 On June 9, 2010, the Congress of the Philippines proclaimed Aquino the winner of the 2010 presidential election. 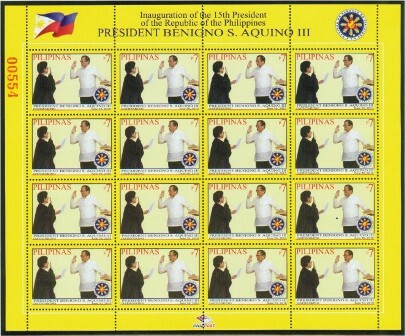 On June 30, 2010, at the Quirino Grandstand in Rizal Park, Manila, Aquino was sworn into office as the fifteenth President of the Philippines, succeeding Gloria Macapagal-Arroyo, by Associate Justice of the Supreme Court of the Philippines Conchita Carpio-Morales.